Last night I went to see the Foo Fighters at Madison Square Garden. I have seen somewhere in the neighborhood of 7,500 bands take the stage in my life, and I think that less than 10 of them have been in arenas. The band was great, and the Garden itself is great, but I am horribly out of my element in crowds that size. I can't seem to lose myself in the concert experience in a venue that large. There are just too many distractions. I think that a lot of people need their experiences to be validated by others. I did enjoy the performance, and I have the utmost respect for Dave G and the band for putting on a flawless spectacle. All that said, here are some observations from my excursion. 1 - I would buy a ticket to the Dave Grohl comedy show. 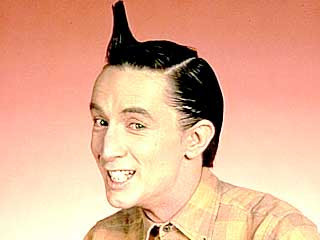 He's clever, entertaining and much funnier than a lot of so called comedians who, incidentally, don't write great songs. Dane Cook does NOT rock. 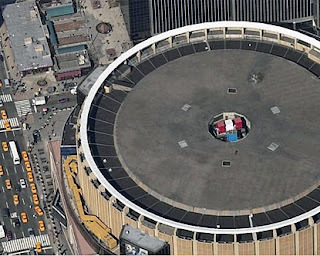 2 - Despite being called Madison SQUARE Garden, the building is actually round. I believe that this accounts for the superior sound that the arena has compared to other hockey rinks. Also, as I have found at countless hockey games, there is not a bad seat in all of MSG. 3 - As a general rule, the only thing that I want to hear less than a drum solo, is the song that drummer sings. I have a pretty strong suspicion though that Dave Grohl has a soft spot for singing drummers. I bet he's a huge Phil Collins fan. But really, who isn't? 4 - Any guy who treks up and down the very steep stairs of the upper levels selling $7.50 cups of BudLight, out of a tray he carry s on his head, will henceforth be known, universally, as a 'BEER SHERPA'. 5 - Some thoughts on humanity. - The 'mob mentality' still amazes and frightens me. People with the need to stand out while simultaneously fitting in are a frustrating bunch as well. While people are attempting to funnel out any door that other people are funneling out of after a rock show, a guy can be semi successful at getting a 'Let's go Giants' chant started, even thought the football season ended weeks ago. 6 - 2008 moments in Madison Square Garden history. - First, the Rangers retired the number of legendary defenseman Brian Leetch. Then, although countless legendary rock bands have graced the stage of 'the worlds most famous arena', the Foo Fighters made MSG history during the very first triangle solo ever to blast forth from the mega-watt PA system. This will surely inspire future generations of musicians to reach new levels of triangle virtuosity and change the face of modern music forever. Rock and Roll history has been re-written. 7 - $7 Lincoln Tunnel + $33 parking garage = $40 in transit to drive into the city for a 5 hour visit. Thats $8 an hour for the pleasure of aggressive driving and 'No Left Turn' signs. 8 - Note to the Foo's. -When you swap guitars to do the one song you have in dropped A tuning, instead of a 20 minute version of 'Stacked Actors', give us that song plus some Melvins covers. I am sure thats where you got the idea, and, Kurt would approve. 9 - Madison Square Garden's Fire Exits are total deathtraps. The well in Buffalo Bill's basement in Silence Of The Lambs was more hospitable. 10 - This may have NOTHING to do with the Foo Fighters or MSG, but I feel that it is still very informative and worth mentioning. - Inflation is up, gas prices are higher than ever, but PeepWorld is still 25 cents (or at least thats what the sign says). Apparently MSG I and II were square and sat on Madison and 26th (the ones spanning from the late 1800s and the early 1900s) and the name has never been updated since. Those big city types are sentimental fools. And the real question - how much were your tickets? Aren't most arena shows over $40 these days?The FFs ain't no cheap date! Yeah, I figured it had to do with being in located in Madison Square originally. Where Madison Square park is. I also know that people into historical buildings are pissed about the fact that they tore down the above ground part of the old Penn Station to build it. Now about the tickets, I believe they were $50 a pop, but I wasn't involved in the purchase. Well then I guess you aren't a cheap date, ha!